The United States Public Health Service published updated smoking-cessation guidelines for doctors. Their reports have consistently identified psychotherapeutic counseling and behavioral therapies as proven effective components of a smoking-cessation program. The most effective component of psychotherapeutic counseling for smokers who want to quit is the development of a smoking cessation treatment plan. This plan includes providing basic information about successful quitting, identifying factors that will increase the risk of relapse, and teaching problem-solving and coping skills. The development of a social support system is equally important for anyone who wants to quit. Support can provided either in a healthcare setting, (for example, being able to talk about the quitting process with a doctor) or by a social network of family, friends, and community. People tend to smoke more often when they’re under stressful conditions. Those who achieve long-term success in quitting smoking have been shown to have more social support and less stress than people who eventually relapse. 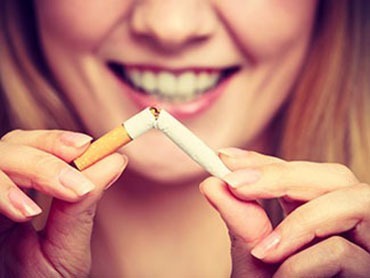 Group therapy offers individuals the opportunity to learn behavioral techniques for smoking cessation, and to provide each other with mutual support. A review of studies reported that group therapy for smoking cessation significantly improved people’s success rates as compared to self help materials, such as books. The researchers suggested that group therapy was particularly effective when used in conjunction with other interventions, such as individual psychotherapy sessions. Nicotine Anonymous (NicA) is a non-profit 12-step model for people who want to end nicotine addiction. The primary purpose of Nicotine Anonymous is to help all those who would like to cease using tobacco and nicotine products in any form. NicA uses the same 12 steps as A.A. to help people overcome tobacco addiction. Guided imagery has been a useful intervention in helping people to stop smoking. Guided imagery is usually done by a psychotherapist who guides the patient through a series of images with the intent of causing a behavioral change. A study with 84 adult smokers demonstrated that guided imagery treatments were effective in reducing smoking rates. Success rates for quitting smoking were 67% for the guided imagery group, compared to 27% for the control group. Another study of 71 smokers found that, guided imagery was an effective intervention for long-term smoking cessation and abstinence in adult smokers. Research has long affirmed hypnotherapy’s effectiveness in helping people to quit smoking. In his book Hypnosis for Smoking Cessation: an NLP and Hypnotherapy Practitioner’s Manual, David Botsford points out that in order for hypnotherapy to be effective for smoking cessation, the hypnotherapist must fully engage the client during every stage of the session. According to Botsford, this attention to detail prevents the smoker from creating resistance that prevents them from being successful. A study of 60 people who wanted to quit smoking found that undergoing single hypnotherapy sessions significantly increased abstinence rates. The results lasted at a 48-week follow-up. Another study of single-session hypnotherapy on smoking cessation was equally successful. In that study, researchers observed that 20 to 35% of smokers who underwent hypnotherapy by highly trained hypnotherapists succeeded in quitting smoking and had not resumed as of a year later. A study at Texas A & M University reported that hypnotherapy sessions helped significantly increase the chances of smoking cessation. Twenty-one patients enrolled in an HMO underwent three session of hypnotherapy. At the end of treatment, 81% of patients reported that they had stopped smoking, and 48% reported abstinence at 12 months post treatment. Mindfulness Based Stress Reduction (MBSR) is a type of relation psychotherapy that involves learning meditation techniques which help to elicit a feeling of peace and relaxation. A study at the University of Wisconsin School of Medicine revealed that MBSR is a highly effective smoking intervention. Eighteen subjects were enrolled in the study with an average smoking history of almost 20 cigarettes per day for over 26 years. The MBSR instructors taught mindfulness techniques in eight weekly group sessions. All 18 participants attempted smoking cessation during the seventh week without any additional therapies. At the end of six weeks, 10 of 18 subjects (56%) had quit smoking. Researchers noted that compliance with meditation was positively associated with smoking abstinence and decreases in stress and distress. Botsford, David. (2007). Hypnosis for Smoking Cessation: An NLP and Hypnotherapy Practitioner’s Manual. Carmarthen, Wales, UK: Crown House Publishing. Fiore MC, Bailey WC, Cohen SJ, et al. (2000). Treating Tobacco Use and Dependence. A Clinical Practice Guideline. Rockville, Md: US Dept of Health and Human Services; 2000. AHRQ publication No. 00-0032. McEwen A, West R, McRobbie H. Effectiveness of specialist group treatment for smoking cessation vs. one-to-one treatment in primary care. Addict Behav 2006 Sep;31(9): 1650–60. Nides M, Leischow S, Sarna L, Evans SE. Maximizing smoking cessation in clinical practice: pharmacologic and behavioral interventions. Prev Cardiol 2007 Spring;10(2 Suppl 1): 23–30. Stead LF, Lancaster T.Group behaviour therapy programmes for smoking cessation. Cochrane Database Syst Rev2005 Apr 18;(2): CD001007. Wynd CA. (1992). Personal power imagery and relaxation techniques used in smoking cessation programs. Am J Health Promot 1992;6(3): 184–9.